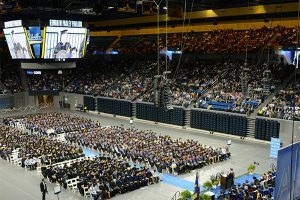 The UCLA Henry Samueli School of Engineering and Applied Science will hold its 2017 commencement on Saturday, June 17, at Pauley Pavilion. Approximately 720 bachelor’s degrees, 450 master’s degrees, and 120 doctoral degrees will be conferred at Saturday’s ceremony. Artificial intelligence pioneer and UCLA Engineering alumnus Adam Cheyer MS ’93 will be the featured commencement speaker. Cheyer is best known as a co-founder of Siri Inc., which developed the eponymous personal assistant technology on Apple devices. Today, Cheyer is a co-founder and vice president of engineering at Viv Labs, a startup dedicated to providing the world with “an intelligent interface to everything.” Cheyer had also been a program director in SRI’s Artificial Intelligence Center, where he served as chief architect of the CALO project (Cognitive Assistant that Learns and Organizes), one of the largest government-sponsored AI and machine learning projects in U.S. history. Computer science senior Frank Chen has been selected as the student speaker. Electrical engineering senior Jaclyn Yangyuen will sing the national anthem. The full list of graduates receiving honors at commencement is here. Nearly 9,000 tickets for the graduates’ family and friends will be distributed. The ceremony will be streamed live. Information on the event is available here.